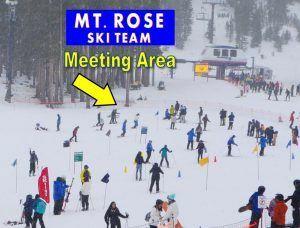 The Mt Rose Ski Team is comprised of developmental and competitive programs for skiers 6 year olds and up. Camaraderie, respectfulness and team spirit are the foundation of an atmosphere that paves the way for progress towards improving skiing technique and personal confidence. The team caters to those athletes of an intermediate to advance ability who want to refine their skiing. The Rippers program is designed for athletes looking for season long coaching in a fun environment. Athletes in this program will develop their skiing skills through a fun and challenging weekly curriculum, learning techniques to increase their confidence and skill level in skiing. Family Ski Days: These are dedicated weekends for your athlete to be able to ski with family and friends. No organized coaching on these weekends. This program focuses primarily on all-mountain skills. This is a non-racing program. The ideal candidate for this program is an athlete who has mastered the majority of the necessary basic skiing skills on a variety of terrain and snow conditions and is interested in advancing their all-mountain skiing skills without participating in a formal competitive team. The ideal candidate for this program are athletes that are interested in pursuing competitive alpine ski racing. The Lake League program builds upon the basics and fundamentals of skiing as well as the introductory racing skills learned in the Shredders program.The 2 weekend day program allows time to personalize coaching to the needs of each individual athlete. Participants in the Lake League program will be introduced to various disciplines of competitive ski racing through the Tahoe League Race Series. Additionally, this program allows for the athlete to foster more independence on the mountain as more responsibility, knowledge, and maturity is expected of Lake League athletes. Family Ski Days: These are dedicated days for your athlete to be able to ski with family and friends. No organized coaching on these days. Christmas Dec 24,25,26, and 27. The Competition Program is designed for athletes looking to maximize skiing and racing performance. Athletes will be part of a team environment with a core training progression based in Slalom and Giant Slalom racing. Athletes progressing and demonstrating sufficient skills will have the opportunity to move to Super-G and Downhill. Athletes in this program will be racing in the Far West USSA competition programs. Training at this level also provides excellent preparation for High School racing. Additional midweek training may be available (as race schedules allow), dates will be posted on the Ski Team Calendar. Christmas Dec 24, 25, 26, and 27. The Freeride training program invites skiers to experience the exciting world of freeride skiing. Athletes will receive instruction on using correct technique over all terrain types and terrain parks features. Athletes will learn basic grabs and rotations (no inverts) over park jumps and sliding hard features including rails and boxes. Progressions start at entry level on each feature. Like all Ski Team programs, the Freeride Ski Program is based upon camaraderie, respect, mountain etiquette and an overall love for the sport. Athletes may compete in local events such as the Tahoe Junior Freeride Series (TJFS) and local rail jams. Events will be posted on our calendar as they are announced. Separate fees apply for those choosing to compete. Always learning, always improving, no matter the age. The Mt. Rose Master’s Program is for adult ski racers who are looking to improve and their skiing and racing skills. Athletes may participate in the Far West Masters USSA competitions. For those choosing to compete, athlete is responsible for individual fees.Meeting Area: Meet the Coach at the Blazing Zephyr 6 loading area at 8:30am. Drop in training available for $50. 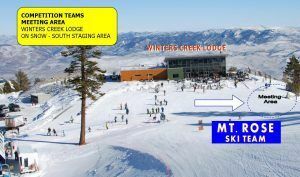 Purchase training ticket at Skier Services at the Winters Creek base area before meeting the group at the base of the Blazing Zephyr 6. Family Ski Days: These are dedicated days for you to ski with family and friends. No organized coaching on these days.